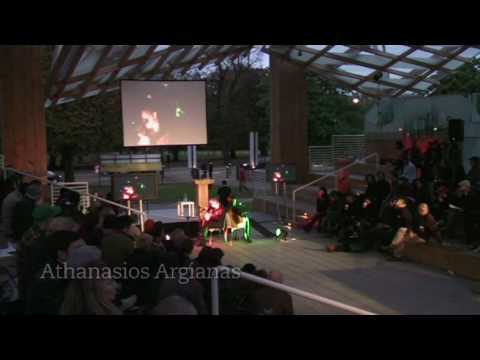 Manifesto Marathon, the third in the Serpentine Gallery’s acclaimed series of Marathon events, took place in the closing weekend of the Serpentine Gallery Pavilion 2008, designed by Frank Gehry. The Manifesto Marathon came at a time when artists had begun to work less in formal groups and defined artistic movements. It showcased a new generation of artists alongside practitioners from the worlds of literature, design, science, philosophy, music and film who were returning to the historical notion of the manifesto. The Manifesto Marathon drew on the Serpentine Gallery’s close proximity to Speakers’ Corner in Hyde Park, which has been used as a platform by Karl Marx, Vladimir Lenin, George Orwell and William Morris, among many others. For more details of the about the participants and their biographies, download the Manifesto Pamplet. This spectacular structure, designed and engineered in collaboration with Arup, was the first built project in England by legendary architect Frank Gehry. Anchored by four massive steel columns, the Pavilion was composed of large timber planks and a complex network of overlapping glass planes that created a dramatic, multi-dimensional space. The previous year’s legendary, 24-hour Interview Marathon was expanded in scope. Download Choose Drill flyer here , Niermann and Kyes took turns to read out their manifesto, one in an ongoing series The Choices .